Buriram province offers a number of exceptional tourist destinations for those interested in investigating Thailand’s northeastern region of Isaan. The province is culturally unique and is home to ethnic Thai, Lao, Khmer, Chinese and Kuy populations. This is evident in the diversity of the landmarks and businesses throughout the province. Little is known about the history Buriram prior to the Ayudea period. However, landmarks found throughout the region are often representative of Buriram’s Khmer heritage, as Buriram was once under the rule of the extensive Khmer empire. Once such landmark is Phanom Rung. Phanom Rung lies near the small city of Nang Rong and is a major tourist attraction for Thai and foreign travellers alike. This incredible landmark was originally a Hindu shrine dating back to between the 10th and 13th centuries. Like other Khmer sites of its time, Phanom Rung is constructed of laterite and sandstone. The aesthetic of Phanom Rung is not unlike that of Angkor Wat in Cambodia, which lies a short distance from Buriram’s border. The concept of Angkor Wat is rumoured to have been characterized by the architecture of Phanom Rung, as both sites share a number of similarities including building materials. Phanom Rung is often referred to locally as the prototype for the later constructed Angkor Wat. A day trip to Phanom Rung is recommended as the site is extensive and offers much to see. Also, be prepared to climb a short distance as the landmark sits atop a hill. A day trip from Buriram city is possible, as well as an overnight stay in Nang Rong. We gave details on how to do so in a previous post titled Phanom Rung. Within Buriram city limits lies the inactive volcano, Khao Kradong, and at its peak sits the Golden Buddha. At the base of the volcano is an active Buddhist temple to one side and a man-made lake, the Kradong Reservoir to the other. Buriram locals often visit Khao Kradong so be prepared for weekends to be busy. Entrance to Khao Kradong is free, but it’s recommended that visits are reserved for during the day as there is no security at night. Parking is free as well, as is use of the public restrooms. There are a few restaurants on-site which offer a variety of Thai and local dishes, in addition to water and refreshments. Visitors have access to a steep stairway leading up to the Golden Buddha. You can also reach the top via a paved road on the far side of the volcano. This route is safe for both drivers and pedestrians alike. If you choose to take the paved road, you’ll see many smaller Buddhas, including a Reclining Buddha. For directions on how to visit from Buriram city centre, please read our previous post on Khao Kradong. 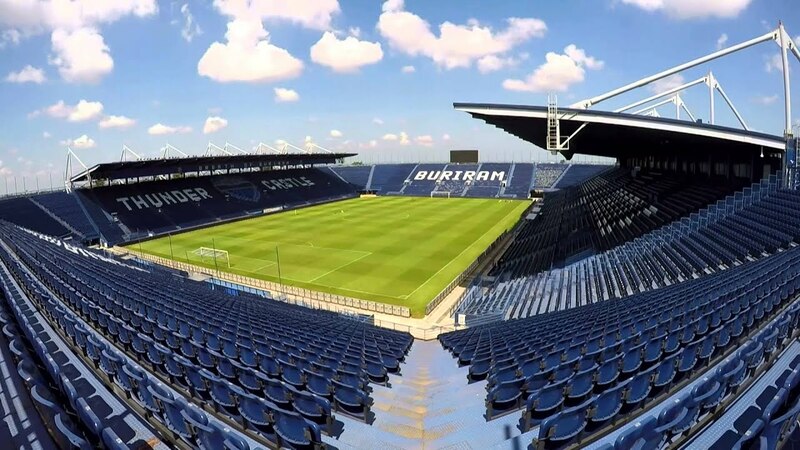 Buriram Stadium/Chang Arena is a 32,600 seat soccer/football stadium in Buriram city. The stadium is home to Buriram United, Buriram’s Premier League champion team and is often referred to as Thunder Castle. Home matches in Buriram are hard to forget. People travel from all over Thailand to join in the fun and the entire city is a celebration. The world class stadium attracts droves of people and matches are played day or night. International matches can also be caught at the stadium, including FIFA qualifying matches. For more information on how to visit the stadium visit our post on football/soccer in Buriram.